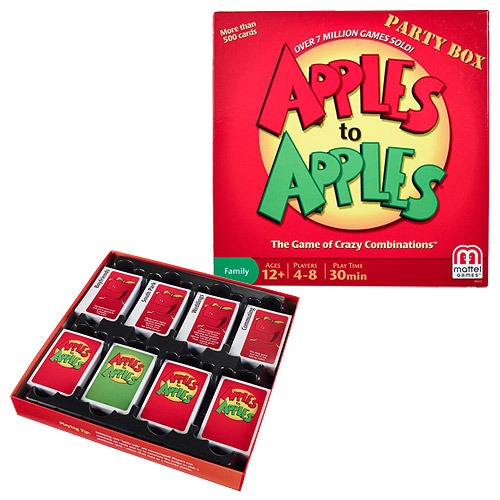 Get the party started with the Apples to Apples Party Box Game! This infamous wild card and party game provides instant fun for 4 to 8 players! It's as easy as comparing apples to apples, too, just open the box, deal the cards and you're ready to play! Select the card from your hand that you think best describes a card played by the judge. If the judge picks your card, you win that round. Don't fret, as everyone gets a chance to be the judge! Each round is filled with surprising and outrageous comparisons from a wide range of people, places, things and events. Fast moving and stimulating, Apples to Apples is perfect for any get-together with family and friends! The Party Box comes complete with 504 green and red cards; the green cards have 2 clues per card, the red cards have 1 clue per card. Play time is 30 minutes. Ages 12 and up.